Perform the COPY Command instantly and easily on your Amazon Redshift instance. DataRow is completely changing the way we use Amazon Redshift with its unique features. One of these features is COPY Command Wizard. It is the new and easy way to perform the COPY command on Amazon Redshift. With the COPY Command Wizard, you can easily perform your COPY command in seconds, and easily upload data to a table. Moreover, you do not need traditional queries to perform this operation. With just a few steps you can complete your COPY process without performing a query. With the COPY Command Wizard in DataRow, prepare your COPY process in just six steps and run it right away! If you wish, save the preferences to run it later. 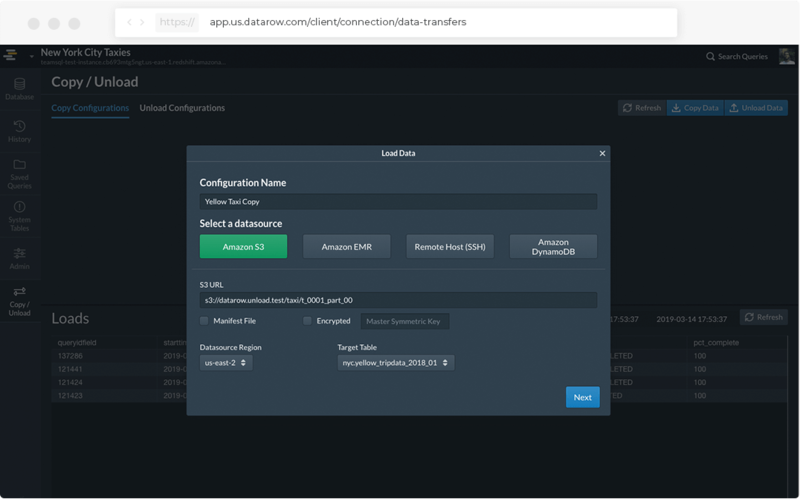 1- Select your data source: Amazon Simple Storage Service (Amazon S3) bucket, an Amazon EMR cluster, or a remote host that is accessed using a Secure Shell (SSH) connection. 2- Select your file type and size: CSV, Fixed width, JSON or Avro. 3- Provide the authorization: Referencing an IAM role that is attached to your cluster or by providing the access key ID and secret access key for an IAM user. 4- Specify a conversion: If you need to specify a conversion that is different from the default behavior, or if the default conversion results in errors, you can manage data conversions by specifying the parameters listed by AWS. 5- Choose Data Load Operations: Manage the default behavior of the load operation for troubleshooting or to reduce load times by specifying the parameters listed by AWS. 6- Run the query or save it for another time.